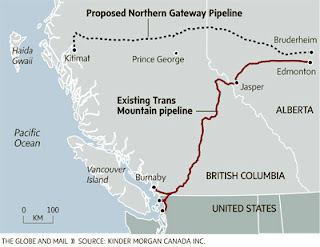 I'm a little late posting it, but last month Kinder Morgan announced that it is interested in almost tripling the size of its Trans Mountain pipeline running from Edmonton to Vancouver. The upgrade is a larger version of its previous plan to increase from the current 300 to 600 thousands barrels per day. The new plan would increase it to 850 thousand barrels per day. The expansion is expected to cost $5 billion. The existing pipeline is currently the only way to get Alberta crude to the west coast. From a regulatory perspective, expanding the pipeline would likely be much easier than constructing the proposed Northern Gateway pipeline, because it would use existing right of ways. The only hiccups are complaints from Vancouver about increased tanker traffic. Tankers have been operating in Vancouver for over 60 years, but the larger pipeline would of course involve more of them. This Washington Post opinion article talks about how alternatives such as this make opposition to Keystone XL in the US self defeating - the high price of oil will make Canada get oil sands oil to market somehow, and by opposing Keystone Americans are encouraging that market to be somewhere other than the US.